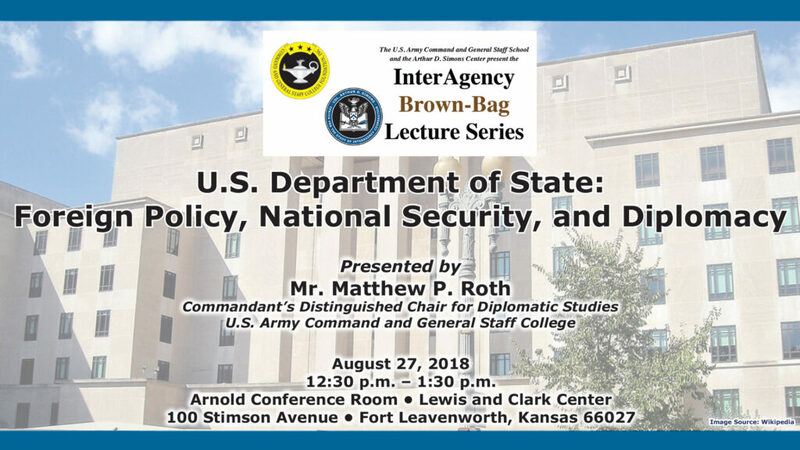 The first lecture for academic year 2019 of the InterAgency Brown-Bag Lecture Series will be conducted at 12:30 p.m., Aug. 27, in the Arnold Conference Room in the Lewis and Clark Center on Fort Leavenworth. Career Foreign Service Officer Matthew P. Roth will lead a discussion on the United States Department of State. In the era of Twitter and the ever-shorter news cycle, American statecraft has continued apace while also undergoing fundamental change. This brown-bag discussion will broadly review the conduct of U.S. diplomacy in the current global environment, encompassing political, economic and social considerations. Matthew Roth is the Commandant’s Distinguished Chair for Diplomatic Studies at the U.S. Army Command and General Staff College in Fort Leavenworth, Kansas, and is the Department of State liaison to the Combined Arms Center. His area of published research is the relationship between diplomatic and military actors and subnational governments. Prior to this assignment, Roth was the Deputy Chief of Mission at the U.S. Embassy in Kigali, Rwanda. Over the course of more than two decades in the Foreign Service he has served in Washington, D.C. and at embassies across Africa and Latin America. Roth has a Master degree in Public Administration with a specialization in urban planning and city/local government from the University of Kansas, as well as a Bachelor of Arts in Political Science and Latin American Area Studies from the same institution. He speaks Portuguese, Spanish, German and Italian.